Hieromonk Ignatios was a very good and virtuous spiritual father. He had perfect indigence and continence and his constant work was prayer. 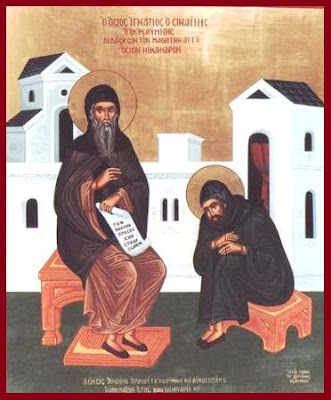 His disciple however, Monk Nikandros, surpassed his Elder. He had greater temperance and indefatigable obedience to his Elder and attained a state of complete dispassion. He never appeared to be joyous or sad but always stood with the same unchanging state of mind. He would do a prostration to everyone and to whatever someone said to him he would always begin by saying "bless father". Nikandros reposed in 1631, over a year prior to his spiritual father Ignatios. After a year the fathers went to the cemetery to bury another brother, and when Elder Ignatios entered to see the relic of Nikandros he found the corpse full and having the color of saffron and it was gushing myrrh. Saint Ignatios left the cemetery with tears, saying: "Thank you, Lord, that even while alive you gave me this information about my novice." Saint Nikandros is celebrated on Bright Wednesday. From Rethymno you rose as a star in the east, Spirit-bearing father; the luminous lover of virtue, non-possessiveness and prayer let us celebrate, for he brightly illumined, ascetics with dispassion, in Sinai as we cry out: deliver us from the gloom of our sins by your prayers Ignatios.